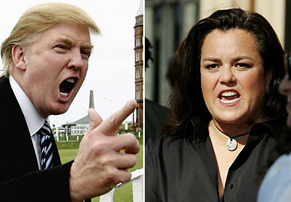 Donald Trump and Rosie O’Donnell, two media personalities who have never kept their mutual loathing for one another a secret, are in the midst of an explosive Twitter feud. O’Donnell revisited her feelings towards the “Celebrity Apprentice” host when she joined the chorus of critics who bashed Trump for deciding to moderate a GOP debate. O’Donnell compared him to Lord Voldemort on Joy Behar’s HLN show last week. O’Donnell tweeted back and attacked Trump’s self-proclaimed wealth. “How many billionaires sell ties and have crappy non reality shows – none – go back to selling snake oil – #bankruptmuch?” O’Donnell tweeted.